Onions grow well in container gardens. The compact roots take up little space and tolerate crowding, allowing you to plant them close together in a limited area. Instead of traditional planter and pots, grow onions in grow bags. Grow bags are available at garden centers or you can turn any bag of potting soil into a grow bag. 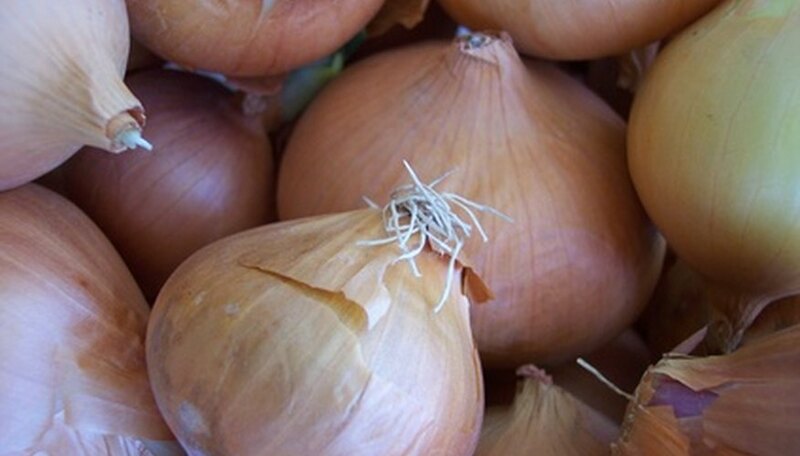 Choose smaller onion varieties for the grow bag or plant green onions. Grow bags do not provide a lot of soil depth, but they do provide the surface area required for a decent-sized crop. Fill a purchased grow bag with compost or a well-drained potting mix. Seal the top closed. Prepare potting soil bags as grow bags by poking a row of small holes in the bottom of the bag. Space the holes approximately 2 inches apart. Lay the grow bag down with the drainage holes on the bottom. Set the bag in an area that receives full sunlight. Cut a rectangle out of the top of the bag, leaving 2 to 3 inches of the bag intact around the edges of the rectangle. Use a utility knife to cut the bag. Water the soil in the grow bag until the excess water begins to drain from the bottom. Like containers, grow bags dry out quickly and may require daily watering. Sow the onion seeds on the soil surface then cover them with ¼ inch of soil. Space seeds 3 inches apart in all directions. Water the onions once a week with a one-fourth dilution of a balanced, soluble fertilizer. Use clear, unfertilized water for daily irrigation. Harvest the onions when the onion tops begin to yellow and fall over. For green onions, harvest the tops when they are the desired size. Use at least 10 lb. bags of potting soil. Smaller bags do not provide the surface area or depth required for onions. Onion bulbs develop primarily on the soil surface, so they do not need a lot of space between them for root development.